The Parachute Drop was a text layout/formatting project commissioned by the translator of the book, Prof. Christopher Wise of Western Washington University, Bellingham, Washington and published by Africa World Press, Trenton New Jersey. 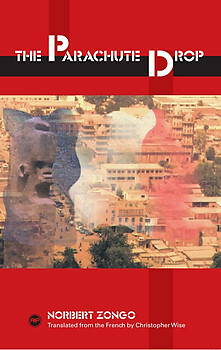 The book is available for order on the company's website- http://www.africaworldpressbooks.com/servlet/StoreFront and all major online retail stores including amazon.com and Barnes and Noble. Norbert Zongo was Burkina Faso's most respected journalist before his politically motivated murder in 1998. As an editor of the newspaper l'Indépendent, Zongo wrote under the pen name of Henri Segbo, frequently attacking governmental crime and impunity, or what he called "mobutuization," after the notoriously corrupt Zairean dictator Mobutu Sese Seko. A fierce advocate of free-speech, Zongo openly criticized President Blaise Compaoré’s long reign of terror, extortion, and impunity in Burkina Faso. After surviving several attempts on his life, Zongo was killed along with his brother Yembi Ernest and two other traveling companions when his car was fire-bombed by members of Compaoré's presidential guard. Zongo's death was followed by an extreme period of political unrest in Burkina Faso, which threatened to destabilize the Compaoré regime. Zongo's novel The Parachute Drop is an eerily prophetic narrative foretelling many of the events that preceded his death. His novel shows how a fictional West African nation named Watinbow is "mobutuized" by a succession of tyrants, foreign advisors, and external financial agents. President Gouama, a man of demonic energy, malice, and greed, is toppled in a coup d'état and must now confront the people of Watinbow, whom he has betrayed. The Parachute Drop provides rare insight into the psychology of a corrupt African leader. For those hoping to understand the nightmare of contemporary African politics, Zongo's novel is an excellent place to begin. "The Parachute Drop is both a story of the ugliness of postcolonial misrule and also the beauty of resistance. The ugliness, embodied in a neocolonial dictatorship, leads to the author’s end; but the resistance lives after him to continue the challenge and affirm the resilience of the human spirit. In this novel, with its clear and readable English translation, Zongo’s spirit rises from the dead to tell the oppressor: I will never stop to fight for a more humane Africa." CHRISTOPHER WISE is an associate professor of English and comparative literature at Western Washington University, Bellingham, Washington. He is the editor of The Desert Shore: Literatures of the Sahel and Yambo Ouologuem: Postcolonial Writer, Islamic Militant. Manufacturer: Africa World Press, Inc.